This week at the HET we have taken the top end of the telescope so that we can rework the layout of the IFU fibers and add 11 new fibers. That will leave just 17 IFU fibers to be installed. Just to be clear this is not spectrographs being installed but just the IFU fibers that feed future spectrographs. At the moment we have 41 spectrographs units installed and stable. This means we are not more than half way towards our total goal of ~78 units. This entry was posted in HETDEX, VIRUS on July 25, 2018 by shetrone. It has been a while since I posted and I think one of our biggest pieces of new is that we are now regularly observing with HPF. Not only is this instrument being used to observe host stars for planets but there are astronomers who are using it to observe planetary nebulae looking for new elements being born in the deaths of stars just slightly heavier than our sun. This new instrument is easy to use, reliable and a great addition to the HET. 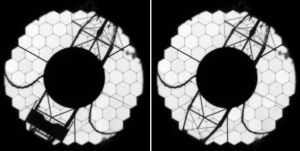 The other big news is that we now have 40 double barreled spectrographs installed within VIRUS. That means that we are now more than half way to have VIRUS fully populated. This entry was posted in HPF, VIRUS on July 12, 2018 by shetrone. This week we had a number of break through moments. Perhaps the most prominent is that after weeks of rewiring and adding new shielding we may finally be at a point where the VIRUS array is fairly stable. We have 36 VIRUS units installed (each unit is 2 spectrographs) so a total of 72 spectrographs up for the last 5 days. Another big breakthrough is in observing automation. We have a piece of software called OCD (Observatory Conditions Decision tool) which monitors the metrology (seeing, transmission and sky brightness) from the telescope and decides if HETDEX observations can be made. If allowed it will also take over the control of the TCS and VIRUS instrument and start observing HETDEX targets with only brief pauses to get confirmation from the telescope operator that we are on the right setup star. Using this new tool we were able to observe a full night of HETDEX targets with a minimum of overhead (even a few targets with just 3 minute setup times). This is faster than the fastest resident astronomer and telescope operator pair working together. Congratulations to the HETDEX software team who traveled out from Germany to help us get it all working efficiently. This entry was posted in Instruments, Observing, VIRUS on April 27, 2018 by shetrone. This week we continued with HPF and Laser Frequency Comb (LFC) commissioning. 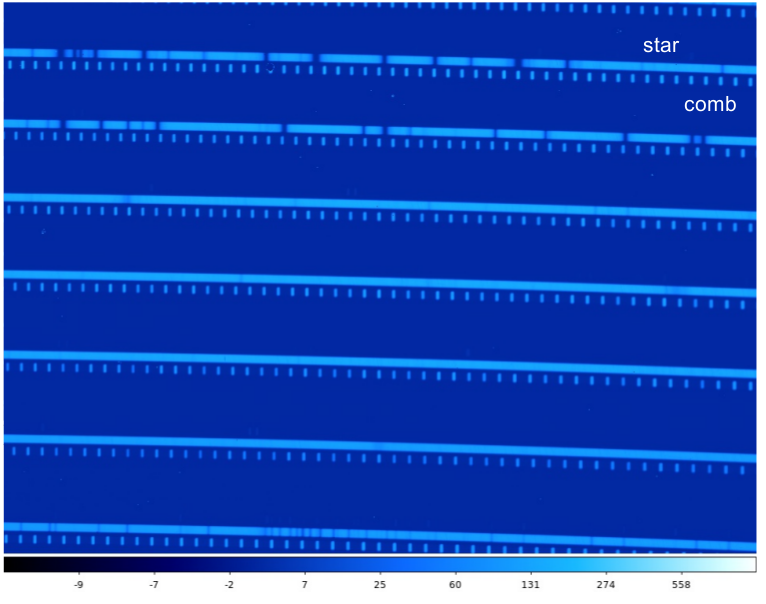 We made a lot forward progress in getting spectra with the comb and had our official “first light”. Below are a few pictures that might help visualize some of what transpired. A slide that shows the basement of the HET where the HPF and LFC live. 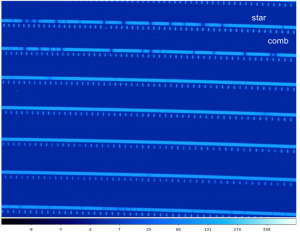 A part of the spectrum from HPF which shows the very regular picket fense of emission lines generated from the LFC just below a stellar spectrum. The spectra are stacked up in an echellogram. 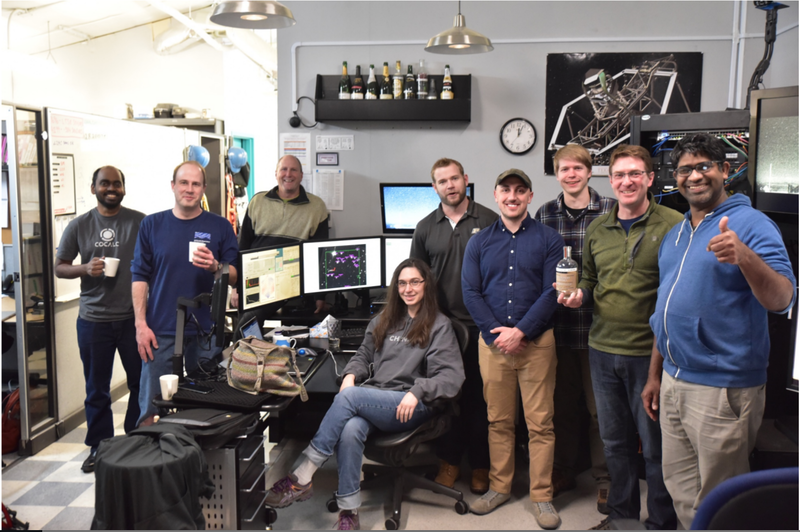 A very happy HPF team, NIST team and HET Night Operations team celebrate first spectrum on the sky. It took a large number of people to get this entire effort going but here are the lucky ones to see it live! This entry was posted in HPF, Observing on March 5, 2018 by shetrone. In the last week we have had a few updates for two of our instruments. For VIRUS we are up to 29 working spectrographs. We actually have several more units but some of the oldest and slightly mis-behaving units have been sent back to Austin for realignment and recommissioning. For HPF we are thrilled to announce that a NIST laser comb has been installed in the calibration room in the HET basement. This allows us to send a picket fence of spectral features through a separate fiber next to the science fibers. During the data reduction and analysis of the HPF spectra they can look at the position of these pickets and determine how the instrument might be subtly moving and correct for it. So far it seems like it is working great. This entry was posted in HPF, Observing, VIRUS on February 27, 2018 by shetrone. 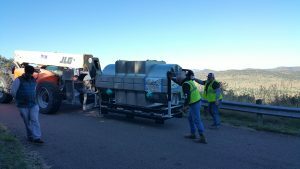 This week the big changes to the telescope have been the removal of the Prime Focus Instrument Platform (PFIP) work platform and the arrival of 3 more VIRUS units. The PFIP work platform, as the name suggests, allowed us to drop people off to work on the PFIP. We will still be able to work on the PFIP but now we have to do it from the JLG worker-lift. The work platform covered up a number of mirrors (about 10% of the light collecting area) as can be seen in the images below taken with our pupil viewing camera. Two images of the HET pupil taken with our pupil viewing camera before (left) and after (right) the PFIP work platform was removed. With the delivery of 3 more VIRUS units we now have 28 working VIRUS units or 56 spectrographs or more than 12,000 fibers on the sky! This entry was posted in Observing, VIRUS on November 11, 2017 by shetrone.